MTD recently analyzed responses to a survey focused on the presence of booster programs at schools across the country. This survey asked questions regarding types of boosters, parent involvement, funding, and more. The survey was conducted in partnership with the National Association of Music Parents. Below is an online tool which will allow you to interact with the data and make discoveries based on survey responses. This is a sample of some of the data collected, and how the responses can change based on a factor such as school size. 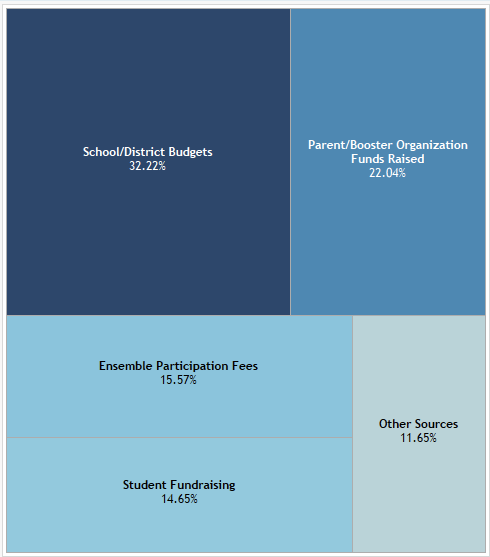 One of the survey questions asked about the percentage of budget contributions to a music program from various sources. 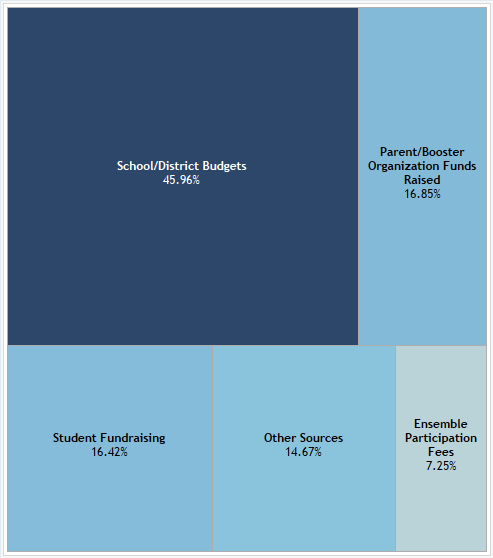 For example, a certain percentage of a program’s budget might come from fundraising every year, while a different percentage is attributed to contributions from the school or district’s budget. In our analysis, we averaged the responses to this question to view general patterns in music programs across the country. 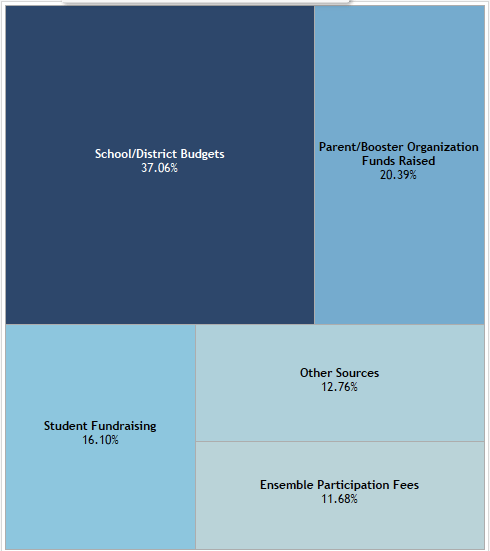 The majority of program budgets can be attributed to school or district funding, followed by parent fundraising efforts, and then student fundraising efforts. We can see interesting patterns when we limit the responses by school size. This is the average breakdown for schools with 500 or less students enrolled. The pattern changes again with an increase in school size. This is the average breakdown for schools with 500-1000 students enrolled. As the size of school increases, the percentage of contribution from school and district budgets decreases. 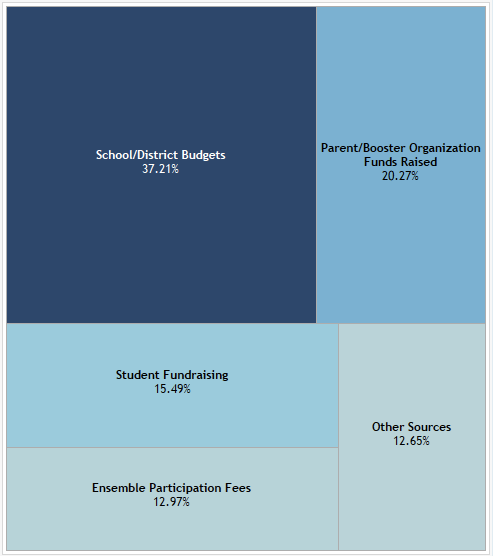 One important thing to note is that while parent and student fundraising contributions were nearly equal in smaller schools, parent fundraising contribution is greater than student fundraising in these larger schools. Finally, let’s look at the largest schools. This is the average breakdown for schools with 1000 or more students enrolled. Once again, the contribution from school and district budgets decreases. In addition, the difference between parent and student fundraising is much more dramatic. Here, parent fundraising is responsible for around 22% of the budget, while student fundraising is responsible for less than 15%. This is more than a 7% difference! Let’s remember that for small schools, the numbers were nearly equal. For schools with 500-1000 students, the difference was only around 4%. We can clearly see that as school size increases, parent fundraising is much more important in the ultimate budget of a music program.